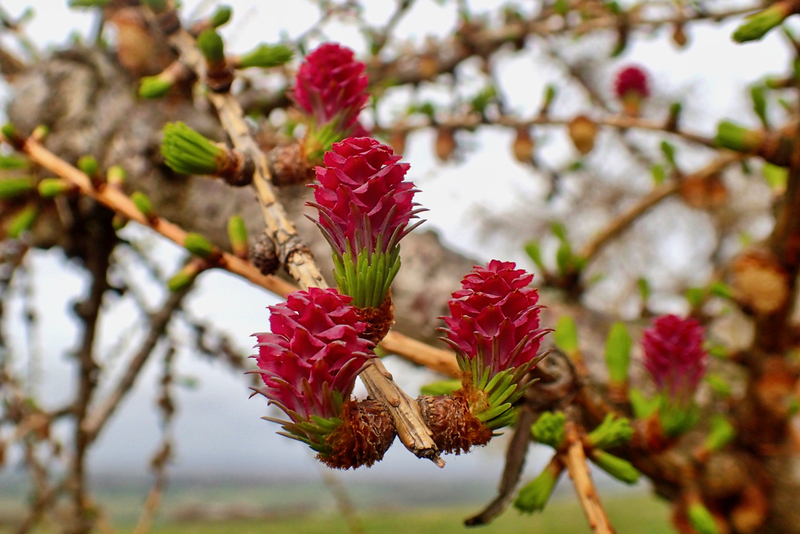 A common name for the female flowers of the European larch tree. The male flowers are clusters of yellow anthers which form on the underside of shoots. Pollination is by the wind after which the roses ripen into the familiar brown cones containing the seeds which dispersed by the wind. The larch is now firmly established in the British Isles after being introduced for its fast-growing timber in the 17th-century. In the autumn the needle-like leaves turn into a golden yellow display before finally falling in the winter gales. But larch is susceptible to the disease Phytophthora ramorum, see my posting last week. The tree is native to continental Europe where the wearing and burning of the wood was thought to provide protection against evil spirits and enchantment.